Gingiber: She Started Pre School. It Is A Good Thing. She Started Pre School. It Is A Good Thing. 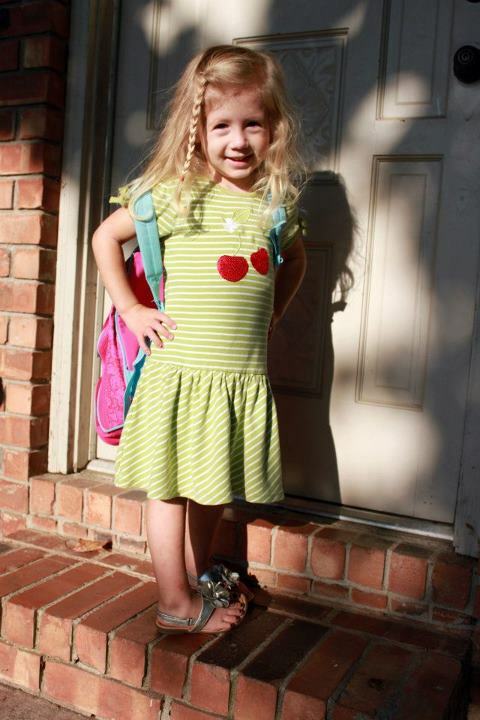 My darling Violet started Pre School last Friday. She is nearing age 4, so I know in my head that she is old enough. But golly where have the past few years gone!? We were so fortunate to qualify for a free pre-school program with our local public school. She will attend everyday. And it is not just "playtime". She will be challenged with a great curriculum, learn Spanish, and make new friends. I will be completely honest. I really needed this. As any mom who works from home can attest, it is nearly impossible to go to sleep at night and not think to yourself "I wish that I could have done it all today". The constant struggle of balancing parenting with maintaining a growing business is nearly impossible. I have been so incredibly stressed the past several months trying to take good care of the girls (they are the #1 priority) while tending to Gingiber. I've been so stressed that I've started having crippling anxiety attacks. Now please don't misunderstand me. My children are not the source of my anxiety. The realization that I have stretched myself too thin, compiled with some other external stressors (that I will not go into) have been the true culprits. It is a ton of pressure to be the bread winner of the family. I digress. I know it may sound selfish to say "yay, I am so glad my kid started school". But it is honest. Now that it is just me and Lucy home I am trying to find a new rhythm. I really do miss Violet. Like usually this time of day I am making Violet lunch. We always sit as close to each other as possible at the table and she will ask me a million and one questions about what we are eating. What we are doing next. Try to negotiate herself out of a nap. Etc. Now there is a lot of quiet in the house. Any other work from home mothers out there relate?